Weekends filled with yoga time and shopping (at the mall and the grocery store) are the best. I took advantage of the last day of tax-free shopping on Saturday and spent Sunday with family and time in the kitchen. A couple of weeks ago, while vacationing on Vieques Island, my sisters and I had a strong craving for pasta. 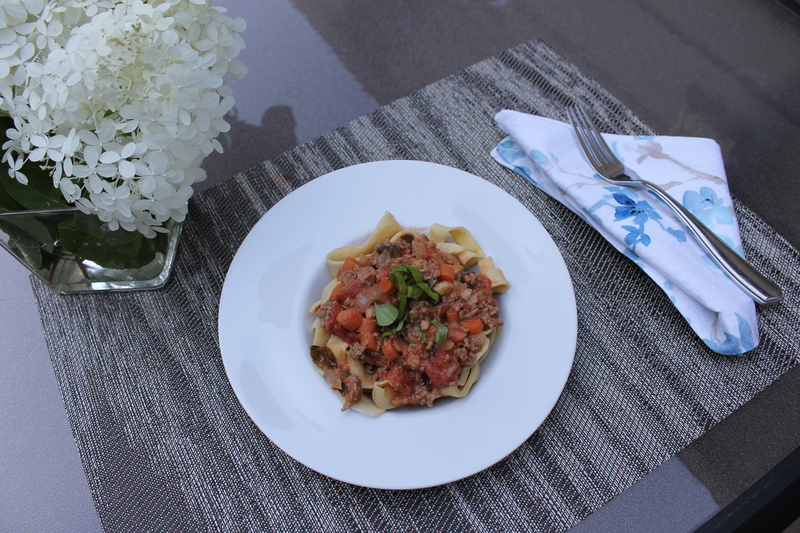 Don’t get me wrong – the meals we had were quite delicious (mahi mahi, conch, paella…), but we were all craving a nice, big bowl of pasta with a hearty meat sauce. I think it was from some commercial we saw on TV. I made some Barilla pasta when we got home, but it didn’t really hit the spot. *Enter lightbulb moment* How about some fresh pasta instead?? 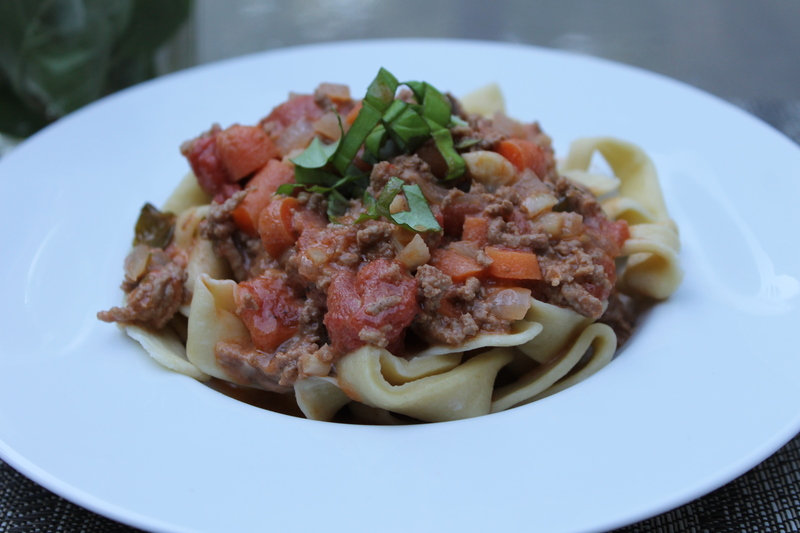 And so, I made some fresh pappardelle pasta with a delicious meat sauce. The pasta was quite difficult to make since I don’t have a pasta maker. Lots of rolling and use of my strong muscles! Place the flour in a mound on a flat surface – it can be a clean countertop, a cutting board, etc. Make a little well in the middle for the eggs. Crack the eggs in the middle of the flour mound. Start kneading ingredients together with your hands. Continue to knead until the flour and the eggs are fully mixed. Roll into a ball, wrap with plastic wrap, and set aside for 20 minutes at room temperature. Roll and form as desired. In a large pot over medium heat, drizzle olive oil. Add garlic and onions and saute for a few minutes. Add ground beef and saute until cooked through. Season with salt and pepper. Add tomatoes and carrots to the mixture. Mix throughly. Set on low to simmer for approximately 20 minutes. Add basil leaves and any additional seasonings.